When the time to comes to begin thinking about estate planning, it is advised that you incorporate a health care proxy. As part of the estate planning from the law firm of George C. Malonis, we can put together a comprehensive legal health care proxy so you can protect your rights, your wishes, and safeguard everyone from disputes or confusion if the time comes where someone needs to make very important decisions for you. 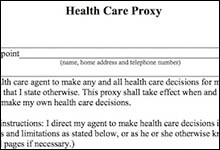 A health care proxy is essentially a legal document that specifically designates a person who can legally decide your medical care, treatments, life support issues, or any other medical decisions if there comes a time when you are no longer able to do so. While many may assume this is a matter to be considered when you reach a certain age or are diagnosed with a specific illness, the need for a health care proxy can arise at any age. An accident, mental illness, injury, or any other debilitating condition can occur without warning. If you are unmarried, you should take the legal step towards ensuring your wishes are upheld and known before they ever need to be. Simply making your wishes known to your family is just not enough. At the law firm of George C. Malonis, we understand how certain unexpected health issues can cause extreme stress and emotionally driven decisions which may not be what you want or what you need. Having the law firm of George C. Malonis draft a very clear, customized and detailed health care proxy for you can help ensure your wishes are legally binding can help you and your loved ones find security in knowing these decisions have already been made. It can be the most important decision you make as there is nothing more important than your health. If you let our firm handle your health care proxy needs, we can help you navigate the process and help you best express your specific wishes. With compassion and understanding, George C. Malonis is the local and knowledgeable source for all of your Massachusetts estate planning and health care proxy needs. Attorney Malonis is also someone you can appoint to be your health care agent to who can assist with drafting a will or trust.